I thought you might like to have another step by step journal page, using Dylusions Write between the Lines stamp set and an easy masking technique. 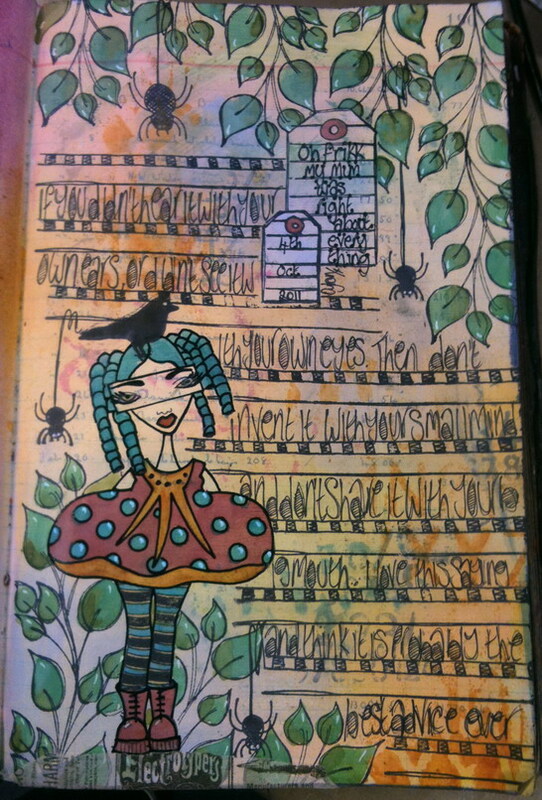 Dylusions stamps, Write between the Lines, Further around the Edge, Curious Corrin, Basic Backgrounds, Bits n Bats. 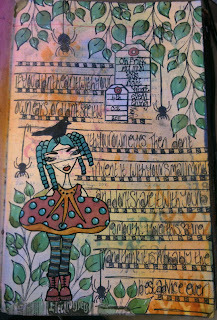 Add the dabbers all over the journal page and blend in with your fngers. I have chosen 5 colours all from the Lights . If you stick to one of the colour tones, Lights, Brights or Earthtones, no matter how many colours you use they will always coordinate beautifully. I am normally know for bright colours, but wanted a paler look for ths page. This is the Write between the Lines stamp set. It includes all my favourite lines to journal between and the tags are fabulous when masked. Ink the medium tag with Jet Black Archival ink and stamp onto the journal page. before you clean the stamp, press the image onto some scrap paper. Cut out the image exactly on the lines, and place over the image on the page. This is your mask. Ink up the large tag and stamp onto the page slightly overlapping the mask. Again, stamp onto scrap paper and cut out. This is what your stamped images will look like. Cool isn't it..? It looks as though the small tag has been placed over the large tag. Stamp the image starting at the top of the page. Place all the masks back on the images, and lightly spray the Sunshine all over the page. Remove the masks.... Cool effect, don't you think.? and spritzed a little puddle of each onto the Non Stick Craft sheet. Whilst the Grass was still wet I added a touch of Lettuce to the base of the leaf. Write in between the journal lines. I have written a quote that I really like. or if you didn't see it with your own eyes. To make Curious Corrin really stand out, go all around the outline with a black glaze Sakura pen. And here's the finished page. Why don't you try one yourself.? Or even three, one with the each colour set of Adirondack Dabbers, the Lights, the Brights and the Earthtones. Absolutely beautiful page! I really love the journaling stamps. Thanks for the step-by-step it was wonderful!!!! Gorgeous page & thank you for the masking tutorial, I really should do more masking. Yum - how cool is this - thanks Dyan! Terrific tutorial! I hope you know that all your hard work is appreciated and put to good use, Dyan. I guess this means masking is what I need to do to create the frog candlabra. Personally,I think it's time to unlock the cuff and allow you some retail therapy. Wow, thanks for this wonderful step by step tutorial. Thank you so much for sharing this. I have wondered many a time how some of the pages come into being. This one is fab. Great tutorial Dayan thank you for showing, you give me such inspiration and laods of useful tips too!! Love the finished page as always. What a fabulous page!You make it look so effortless with your great instructions! Thank you for the great tutorial, must have a play. I love it! you always make things look so simple...until I have a go! I LOVE your step by step. off for a weekend event this weekend.. must try!! Ooooh lots to tell today.